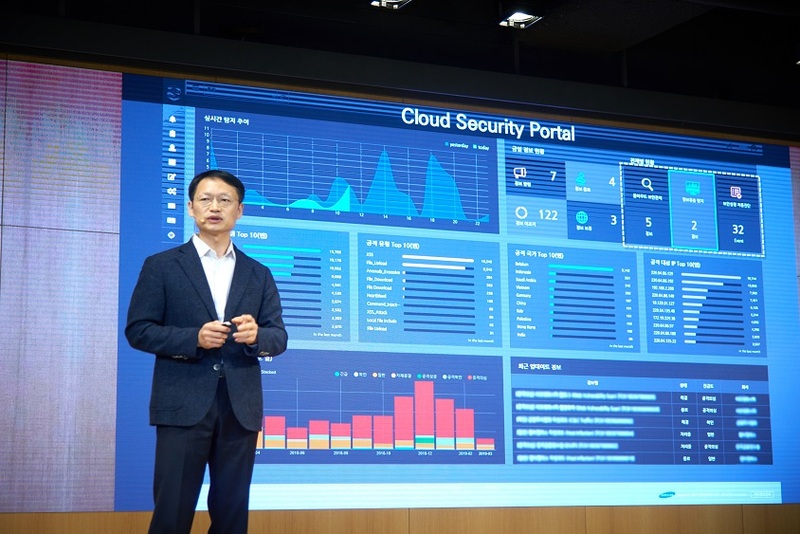 Samsung SDS (President & CEO, Dr. WP Hong, https://www.samsungsds.com) introduced the features and threats of cloud security, and unveiled its strengthened cloud security service developed based on Samsung SDS’ technological experiences and expertise at a media day event held on March 14. Samsung SDS emphasized its cloud security service based on 3 security principles – prevent ‘Intrusion’ of cyber-attacks, prevent ‘Leakage’ of corporate information, and make breached data ‘Useless’ – can relieve various concerns around cloud security. First, Samsung SDS is a top cloud management service provider in Korea and effectively prevents ‘Intrusion’ of cyber-attacks. The service automatically detects, analyze and defend against the cyber-attacks by deploying AI technologies with Threat Intelligence (TI) accumulated by Samsung SDS. Secondly, Samsung SDS prevents ‘Leakage’ of crucial corporate information with its prevention service. The prevention service automatically monitors cloud users’ actions, connected devices, and locations, etc. to detect and shut off intentional or accidental information leakage. The white box cryptography technology mathematically transforms an encryption key by implementing Samsung SDS’s own algorithm, making it impossible for hackers to decrypt data. In addition, the homomorphic encryption based analysis technology can fundamentally prevent breach of sensitive data (e.g., personal data) by analyzing encrypted data without decryption. “Samsung SDS will offer end-to-end security services encompassing applications, infrastructure and data in various cloud environments. We will address the concerns of cloud customers by continuously updating our top-class security service with cutting-edge technologies,” added Dr. WP Hong, President & CEO of Samsung SDS. Protect your sensitive data with our optimized 『Consulting – Solution - Services』 proven through a decade of security management experience. Identify vulnerabilities and optimize your security operations with Samsung SDS’s own proprietary methodology. Safely operate and manage your IT, industrial control and cloud environment, secure effective managed services and assess your business’s overall security maturity.